Tuesday was a sad day for Montana when a Broadwater county sheriff’s deputy was shot and killed by two men. The Cowboy and I happened to be leaving Billings Tuesday afternoon as Deputy Mason’s body was being brought to Billings for autopsy, escorted by a huge number of patrol vehicles along I-90. 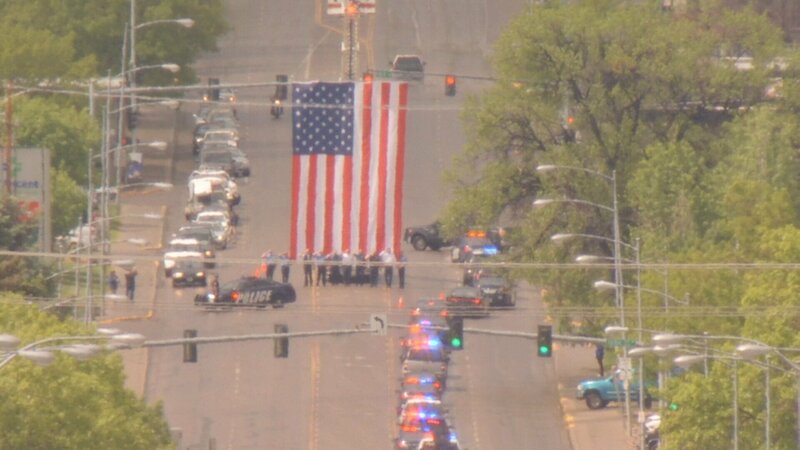 There were fire trucks and people on the overpasses and our local news stated the street in downtown Billings leading to the hospital was lined with people paying their respects. At the Laurel, MT weigh station there were many police officers but also all the truck drivers were standing out in front of their trucks or on their bumpers with hands over hearts or saluting–heart wrenching and very sad. The deputy was only 32 years old and left a wife and three children. The two men responsible were apprehended, a father and son–the son has died of wounds received during a shoot out with police after a 100 mile high speed chase. A very sad day for Montana and that’s all I want to say today–we’ve been busy but that story can wait for another day. Photo borrowed from KTVQ website. Heart is breaking. What else could be more important today… Thank you. So sad. Lovely to see the outpouring of support. Very sad indeed–Montana is in essence a small community.